At disk creation I can select "SCSCI" or "Direct-IO. Question, how can I know "Direct-IO" works for the software that's going to use that disk? I'll put a database on the RAMdisk. Does that usually work on a direct IO disk? I guess, it's just "Try and see" but in general, does a database benefit from Direct IO? The speed increase on 4k acces is large. I have to say that it's just "try and see" stuff as you said...Generally, yes, a database will benefit from Direct-IO ramdisks. Just a comment on your test results - CrystalDiskMark is up to version 6. To get more useful numbers an upgrade might help. I typically only use old versions to compare different hardware with older benches. Those are not my test results. I just linked to pictures of an old thread by Romex on io. 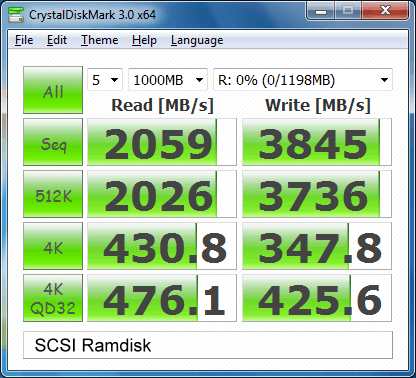 As a sidenote - I've noticed some odd speed results in recent testing with RAMdisk. Some of the results with CDM are higher than a L1 on a NVMe, and some are slower than the L1. 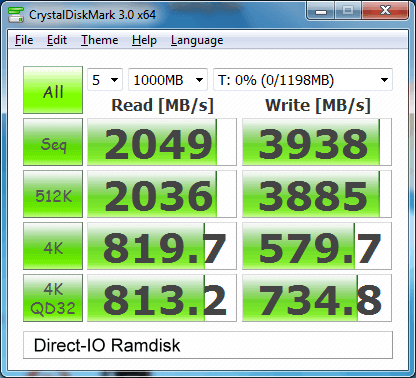 For certain things it appears the RAMdisk is better, and some it is slower than a Primocache cache task.